My friend Emily first piqued my interest in glowing when she posted about her family's blacklight dinner back in 2011. At the time, I'd thought that S would be too young to really enjoy the glowing. Emily's son was almost 4 at the time, so I sort of mentally filed glowing activities away for when S was around 4. I've seen various methods to make things glow, but I really loved how Emily used tonic water. We were actually messing around with another post I'll share with you next week when I wondered -- could make Glowing Oobleck with tonic water? Why Oobleck? Well because it's X's absolute favorite. And I thought I'd see if he wanted to play with us. At first he was just STUNNED that things were glowing. But then he started playing. S and I were grabbing handfuls of the Glowing Oobleck and letting it drip from our hands and X was SOOOOEXCITED!!!!!! Hahaha, these photos are totally blurry, but his little excited face is tooooo cute. I dripped more from way up high and S caught it in her hands while X watched. Whooooa. How cool is this, right? And just like regular oobleck, it's still soooo fun to squish. Mix the cornstarch with tonic water until it's smooth. If there isn't enough "give" to the cornstarch and it is not dripping from your fingers like it is in these photos, add a tablespoon more tonic water at a time. If it is too runny and does not make dramatic ribbons or hold together when you squeeze it with your hand, add more cornstarch a tablespoon at a time. Awesome, Lyn! I hope you all enjoy it as much as we have! Glowing things are so pretty! This is so much fun! I saw your entry on No Time for Flashcards. Thanks for sharing! I'm going to poke around for more cool ideas to keep my girls busy with! Is X wearing a Naarjtie Kids outfit?! He's so cute and I want to try this. Need to find a black light! Hahaha - good eye, Sue! Yep! Love their baby boy stuff!!! I bet you can pick one up at a local store like Target - they're getting pretty popular! HI! I'm wondering something...are all tonic waters and black lights created equal? 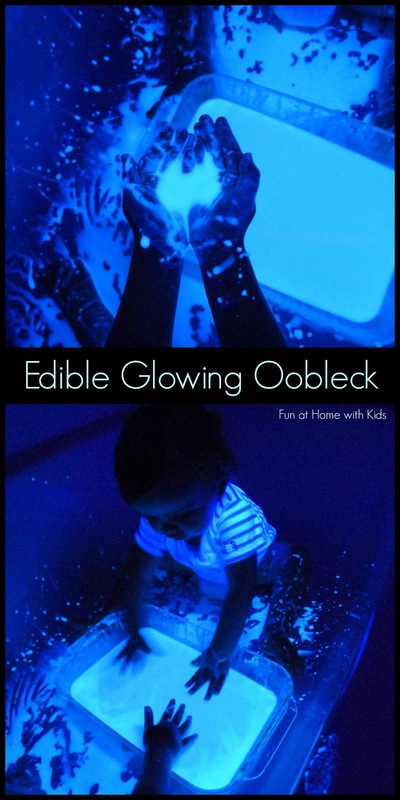 After reading this post I went out and bought both post haste but was disappointed because our first batch of cornstarch goo wasn't fluorescing at all :( I held the bottle of tonic water up to the light and it did glow just the tiniest bit. I'm wondering if I don't have a high enough concentration of quinine or if the black light bulb I'm using isn't a "legit" black light...it's just a bulb you turn into a regular light fixture, not one of the ones with the on/off switch. Thoughts?? Hi Krista! Augh, what a bummer! I would suspect that it is the black light. So long as the tonic water says "with quinine" on it, it's a set amount that's the same in all of them - so it shouldn't be the tonic water. Did your teeth and white clothes fluoresce? If not, I'd definitely blame the black light. We and other readers have had the best success with the 2 foot tube lights. I suspect that the single bulbs just don't put off enough light to do as much. And a quick Google search tells me that yes, everyone thinks those single bulbs stink. A page devoted to all things glowing and blacklight run by a DJ said that less than 2% of the output of one of the regular looking bulbs is actually the right kind of light and he thinks that companies shouldn't even market them as blacklights because they are that weak. Sounds like he might be right! So sorry! And hopefully you will get awesome results with a taller tube light! Excellent! Thank you...I really appreciate you doing some research on this for me! I'm off to go find a legit black light! Thanks again! It will mold unless you freeze it. But you could freeze and rethaw it a few times! Hope that helps.